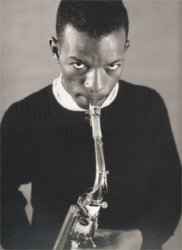 Ornette Coleman (born March 9, 1930 in Fort Worth, Texas, USA - died June 11, 2015 in New York City, New York, USA) was an American Jazz saxophonist, violinist, trumpeter and composer. His album "Free Jazz" gave its name to a whole Jazz sub-genre. He was married to Jayne Cortez from 1954-64. Their son Denardo Coleman is a jazz drummer, and has recorded with each of his parents, beginning at the age of 10 on "The Empty Foxhole".